The smell of hand-shaped beef patties on the backyard grill brings forth happiness from my husband and three children. My husband mans the grill. 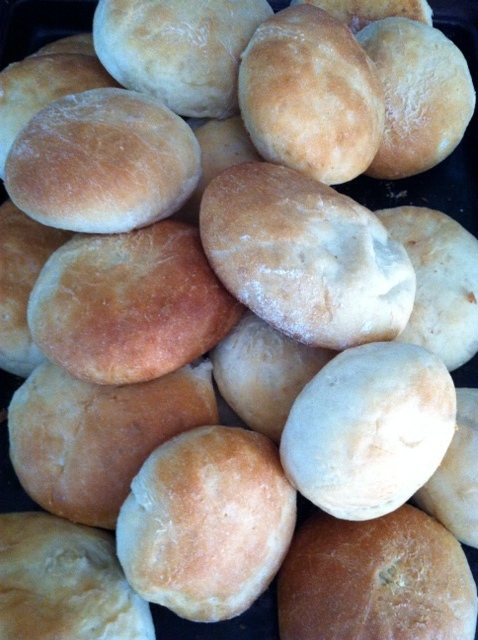 The kids and I roll small balls of dough for our homemade buns. The five of us sit around the kitchen table and bite into tender quarter-pound burgers, eating 2,310 gallons of water. The water footprint of beef surpasses all food. Americans eat 64 pounds of beef each year, representing enough water to fill 1,481 bath tubs. Worldwide the demand for beef grows while our availability of clean drinking water shrinks. The single most important action we can do to lower our water footprint is to reduce or eliminate meat that comes from conventional farms that drain blue water sources and leave behind large gray water footprints, water tainted with nitrogen that feeds ‘dead zones’ in river and oceans. On average, our love for meat accounts for 27 per cent of our total human water footprint. The logic follows that, beef, the meat with the largest water footprint is the simplest way to positively impact water systems. At home, my beef is exclusively organic and pasture-raised. I prefer to purchase direct from the ranch at my local farmer’s market. No hormones, no antibiotics and the cattle are raised in a manner that benefits the land. Because the meat is not as cheap as the conventionally raised beef, I find that we naturally eat less. But when beef is served, not a tasty bite goes to waste. Over the Memorial Day weekend we served burgers in our backyard. The burgers were outstanding. 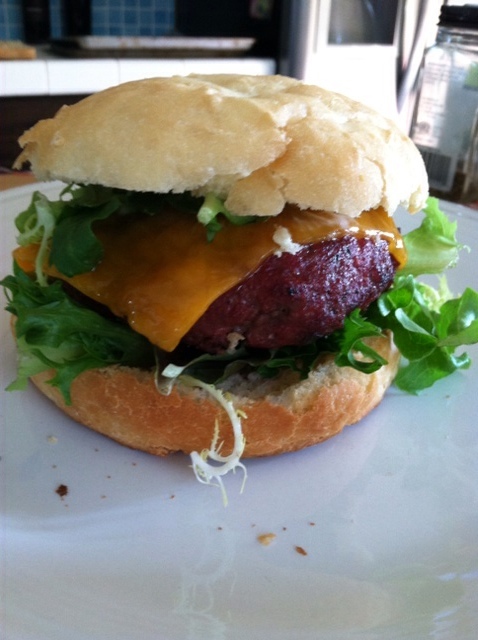 Perfectly grilled, draped with cheddar cheese, squeezed between homemade buns made that same afternoon. My cousin asked, what we put in the meat. The truth is not much at all, only salt, pepper and garlic powder. “The meat is so good that we don’t want to distract from the flavor,” I said. As I answered her, I thought about a cookbook I had recently read by Alice Waters. She wrote how a dish can only be as good as its ingredients. For a burger it starts with the meat and you build around it. The homemade buns kick it up a few notches. I offer you my hamburger recipe only because my cousin asked me for it several times. So you can thank Sandy. In a large bowl mix the ground beef with the spices to your taste. I mix it with my hands. Let the meat sit for at least 20 minutes at room temperature to let the meat sit in the spices. Hand form the patties by rolling balls and slightly pressing them down in between your hands to make a disc shape. Place the patties on something flat like a baking sheet. Be sure to slightly indent the patties in the center with your thumb, top and bottom. This keep them from rising into fat little patties when on the grill. Cook on flame to your taste. We like it medium done. Garnish the burger with organic, local lettuce and organic cheese. I pass on the tomatoes until they are in season. Stir together milk, butter, water, sugar and yeast in a large bowl. Let it stand for 5 minutes. Mix in the salt and flour gradually. Stir until the dough is supple. Divide the dough in half, then quarters, then eighths and finally into sixteenths. Form the dough into balls and place on baking sheet dusted with flour about 3 inches apart. Let the buns rise for 20 minutes away from a drafts. I place the buns to rise in a cool oven. Bake at 375 degrees F for 15 minutes. They should have a slight golden hue when done. Once cooled, slice the buns horizontally with a serrated knife. I freeze the extra buns (unsliced) for the next bar-b-cue. You take the best photos. Can you make the buns with almond or soy milk?